Welcome to St. Isabel Home Health, Inc.
We value every client. We value you! Our responsibility is your health. Support for your recovery, personalized nursing care, specialized therapy and assisted living services for the elderly - St. Isabel Home Health takes care of you! As clients, we encourage you to expect nothing less. We guarantee that you won't be disappointed. St. Isabel Home Health is a provider of efficient and quality home health care services to the counties and neighboring cities in Eagle Pass, Texas. From our agency, you or your physician can select from a wide list of home care programs that you or your family member can benefit from. We are proud of the quality and competence which has made our customers loyal to our agency. In every case we handle, we never compromise our client's health and the well-being of the other members of their household. This is part of our advocacy to promote a holistic approach to health care at home. When you or your family member has a professional to handle health issues, risks for complications are lessened thus enhancing quality living. You're invited to meet our trained health care practitioners who will soon visit you at home to administer affordable, quality-focused home health care programs as prescribed by your physician. Go ahead and give us a call at 1-877-871-1866 to get started with services today! Come to our office or invite us to your home. 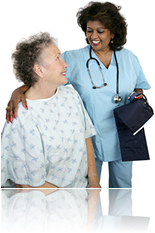 One of our registered nurses will conduct a needs assessment at no cost to you. Looking for a good word? Our clients have lots of it for us. Please take a few minutes to read about the wonderful things clients have said.